Vegetarians should refrain from watching this image for obvious reasons. 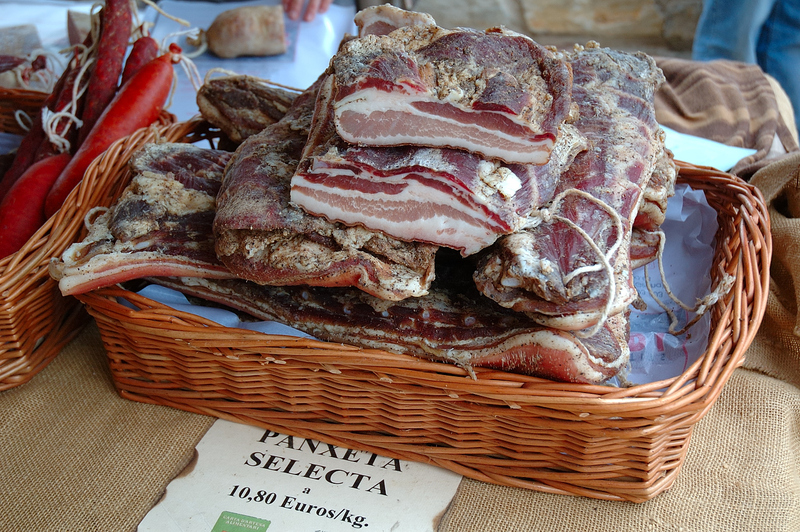 Bacon, in Spanish: Beicon or panceta, has been present in our "diet" since pigs started becoming pork or even earlier, maybe that's why this product was being sold at the medieval market in Suria, a small town near Barcelona. Learn about the origin of the word here. On the left you have a sample of blood sausages or Spanish chorizos, which you can have in slices in a sandwich or simply add to stews, of course you can do that with bacon too. There is an immense variety of pork by-products in Spain and some of them are traditional in Catalonia such as fuet which is a kind of cured sausage (specially appreciated is the one made in Vic, Girona). I'm a vegetarian but I can cope with bacon (mmmmm, bacon). At least to smell it (I don't eat it!). its fun to see it on the blog i have to see. Sometimes I really thought how to post some commmon stuffs in our life, not very beautiful, but very familiar and nice. That's some serious bacon. I try not to eat bacon, but I have a weakness for spicy sausage (probably worse for the health). I LOVE bacon! But it looks a little gross unsliced for some reason. It is not the most beautiful of foods, but to those of us who have sampled it on a sweet city side street, your photo brings warm and delicious memories. Thanks for the post. -Jackie, wise decision not to eat it as I guess it is not that nutritious or healthy but hmm it tastes, and smells good as you remark so well! -Luggi, I like spicy sausages too. Although bacon and eggs is a whim at least once a year. -Susan, gross in appearance but tasty...that's right. I can think of shrimps, lobsters, snails:) I am glad you love it. Coolbluesummer, thanks for adding a proper background to the idea of some good slices of bacon. Jazzy, care for some slices? Thanks!